Ductless HVAC work from licensed, insured, and NATE-certified HVAC contractors. When it comes to the HVAC business, you don’t survive for 26 years in Cherry Hill unless you bring something unique to the table. At Climate Mechanics, we offer cost-cutting maintenance programs, free estimates, and money-saving promotions. 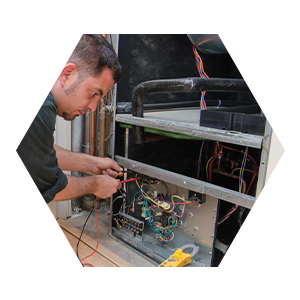 Most importantly we do quality HVAC work at reasonable rates, all while delivering industry-leading customer service. If you’re curious about installing a brand new ductless HVAC system, contact Climate Mechanics to see if this system is for you. We’ll come to your home and help you make the right decision for your air conditioning needs. Call us to schedule a ductless AC repair or installation today. WHY SHOULD YOU CHOOSE CLIMATE MECHANICS? Central air conditioning systems have a long history in homes, but the modern split air conditioner that uses ductwork only started to become common in the 1970s. Now they’re everywhere, and chances are high that you use a split air conditioner to provide cooling to your home or that you’re planning to have central air installation in the future. But a central AC isn’t as simple as a window unit. You can’t just stick it into place and turn it on. You must work with experienced HVAC service professionals from the start. You’ll find just the people in the Cherry Hill, NJ area at Climate Mechanics LLC. We have more than 25 years in the HVAC industry, and we work with all makes and models of central air units. How can we change your climate today? What does the split mean in split air conditioner? It means that the cooling system is divided into two separate parts, one inside the home and one outside. The inside portion contains the air handler and evaporator. It connects through refrigerant and power lines to the outdoor unit, where the condenser and compressor are located. Refrigerant travels between the two units, condensing in an outdoor coil to release heat and then evaporating in the indoor coil to absorb heat. The air handler sends the cooled air from the evaporator into the ventilation system. Presto! Cool air all around the house. Our service professionals will assist you in the process of choosing a new split system AC, and they are always glad to provide informative answers to any questions you may have. We want to ensure you have the right system to meet your needs, not simply the most expensive one we offer. The same applies to air conditioning replacement. Our team won’t be satisfied with seeing you have “the same old thing” when they replace your over–the–hill AC. We want you to have the best! We work with the finest models, but a great air conditioning system is about more than the brand—it’s about the quality of the installation work that goes into it! You can count on our dedication to your comfort needs to ensure that you have the right new air conditioner. No AC system is invincible. Time takes its toll, and parts may break when you least expect them to. However, you don’t have to remain sweating in the heat for long! Just call us 24/7. At Climate Mechanics, we offer a maintenance program that will help save you money over the long run. Consistent maintenance means fewer costly repairs and units that last longer. We’ve saved countless thousands of dollars for our clients over the years simply by helping them keep up with regular maintenance. We don’t believe in one-size-fits-all solutions for our HVAC clients. That’s why we offer a wide variety of maintenance programs so you can pick the one that works best for your system and your budget. Our service professionals are skilled mechanics and have the training necessary to diagnose any central air conditioning trouble correctly. One reason Climate Mechanics LLC has been a success in the HVAC business for so long is because we have a reputation for getting repair jobs done right the first time! We want to see that your air conditioner gives you few troubles to begin with, and we provide routine maintenance services to help make this happen. Everything we do is to ensure that you enjoy the best indoor comfort possible. Give us a call or fill out our online form to request a free estimate.